Cost to get temporary power for a construction site varies greatly by region (and even by zip code). Get free estimates from emergency power specialists in your city. Cost to get temporary power for a construction site varies greatly by region (and even by zip code). Get free estimates from emergency power specialists in your city. How much does it cost to get temporary power for a construction site? Working on a construction site often requires having a temporary power source available before the permanent electricity system is installed and connected. Temporary power can be used to provide electricity for jobsite trailers and equipment, as well as testing electrical systems before they’re hooked up to permanent utilities. If you’re constructing a house or other type of building, many contractors won’t begin work until temporary power is activated. Numerous factors affect the total cost, including total power required, your site’s distance from a utility source, the type of power source you choose, and the length of time you need power. In this guide, we examine the average cost of installing a temporary power supply at a construction site for 1 month. You’ll first need to determine what source you’ll use for your temporary power supply. You can choose between creating a wired setup that connects to a permanent utility source, or bringing in an on-site generator that runs on fuel. 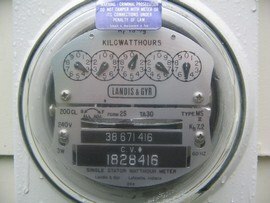 Utility companies may charge a fee for a point-of-service hookup, which can be as high as several hundred dollars. If your nearest utility source is far away, using gas-powered generators can be a good solution. However, this means you’ll have high fuel costs. You may be required to return your generator’s fuel tank completely filled up. Instead of renting a generator, it’s possible to have wired long-distance temporary power set up for additional cost. Choosing the right generator size for your project depends on your energy needs. Generators 10,000 watts and under are best for small projects in which only one or a couple of pieces of light equipment need to be powered at once. Generators suitable for typical construction needs are sized at 20 kilowatts and above. It’s highly recommended that you hire an electrician ($65-$85 per hour) to calculate your energy needs and the most suitable generator size so that you avoid undersizing or oversizing. Using too much or too little of your generator’s capacity can damage it. If you choose a wired setup that connects to a permanent utility source, temporary power supplies can be established overhead or underground. Overhead installations are the most common and they often entail the installation of temporary power poles. Whether you need an overhead or underground installation depends on what the existing utilities infrastructure is at your construction site. You’ll need to contact your local power company to ask about this. The average cost of an overhead installation is $1,200, including labor, materials, connecting the wire from the transformer to the weatherhead, meter 1 installation, and inspection of site location and pole. The average cost of an underground installation is $800, including materials, meter 1 installation, and connecting service to the splice box. When you talk to your power company, ask for a comprehensive list of requirements they have for setting up temporary power. Requirements for voltage capacities, amps, outlets, and structures will be given. There is usually a 60 amp minimum requirement. Power distributors/outlet panels/meters 1 can be rented for $44-$140 per day, $140-$360 per week, and $380-$1,000 per month. Some companies will include this in the price of their services. You may require temporary lighting if construction is taking place in the dark or indoors. One 1,000 watt standing lamp costs $120 per day, $360 per week, $720 per month to rent. One 4,000 watt light tower costs $145 per day, $435 per week, $870 per month to rent. Typical temporary power cables can be rented by the foot at $1 per day, $2 per week, $3 per month. Extension cords/connectors cost $16 per day, $41 per week, $120 per month. Individual plugs cost $2 per day, $6 per week, $17 per month. Additional fuel tanks can supplement your generator’s fuel supply. Renting one can help you save on regular fuel delivery (“drop”) fees. Prices depend on tank size, and there is a wide range of sizes available. A 100 gallon auxiliary fuel tank costs $54 per day, $135 per week, $405 per month, while a 2,300 gallon tank costs $500 per day, $815 per week, $2,155 per month. You may be required to return your rented tank with a full fuel level. Many companies include permit acquisition as a part of their service package. However, if you have to do it yourself, permits usually cost $150 for 6 months, and $350 for 1 year. Specific prices depend on your county and state. Failing to get a permit risks having your power supply shut off, legal action, and fines as high as $2,000 per day a violation occurs. Plan your construction site’s layout before installing power so that the electrical installation doesn’t need to be moved later. Hire an electrician to install ground fault circuit interrupters (GFCIs). GFCIs will turn the power circuit off if it senses the electrical current has derailed on an unsafe path (through water or a living being): $85-$130. Electrical equipment installed outdoors should be covered and sheltered from solar heat, rain, snow, etc. Setting up physical barriers around the equipment will ensure minimum clearance is maintained. Caution barrier tape costs $30 per 1,000’ roll to purchase. Construction barricade rental prices start at $5 per day, $12 per week, $37 per month. Add signs to warn all site workers of equipment presences and hazards. Individual signs cost $5-$200 to purchase, depending on size. Maintenance should be run on generators every 200 hours that they’ve been run. Many temporary power companies offer generator maintenance services and refueling services. You will usually be expected to pay the energy bills during the construction period. How much does it cost to get temporary power for a construction site in my city? Cost to get temporary power for a construction site varies greatly by region (and even by zip code). To get free estimates from local contractors, please indicate yours.